Supermodel Kate Moss, former Rolling Stones bassist Bill Wyman and former royal Sarah Ferguson were among mourners who paid their respects at Peaches Geldof’s funeral on Monday. The private service was held at a village church in Kent -- the same church in which the funeral of Peaches’ mother, Paula Yates, was held in 2000, and where Peaches married her second husband, Tom Cohen, in 2012. 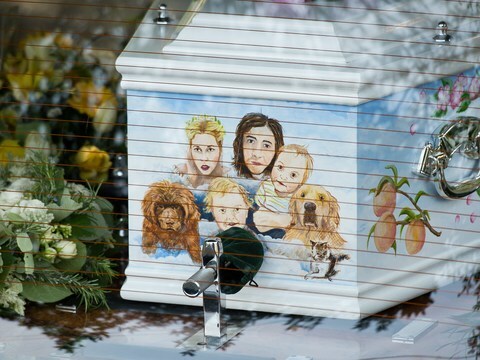 The young woman’s coffin was adorned with a portrait of her with Cohen, their two sons, Astala, 23 months, and Phaedra, 11 months, and their pet dogs. The 25-year-old died on April 7. Police say her sudden death was "non-suspicious and unexplained," and an autopsy was inconclusive, pending a toxicology report.